The Nationaliszation of Industry and the Promotion of the Brotherhood of Man. 1/1, May 1889-April 1891. 32 pp. 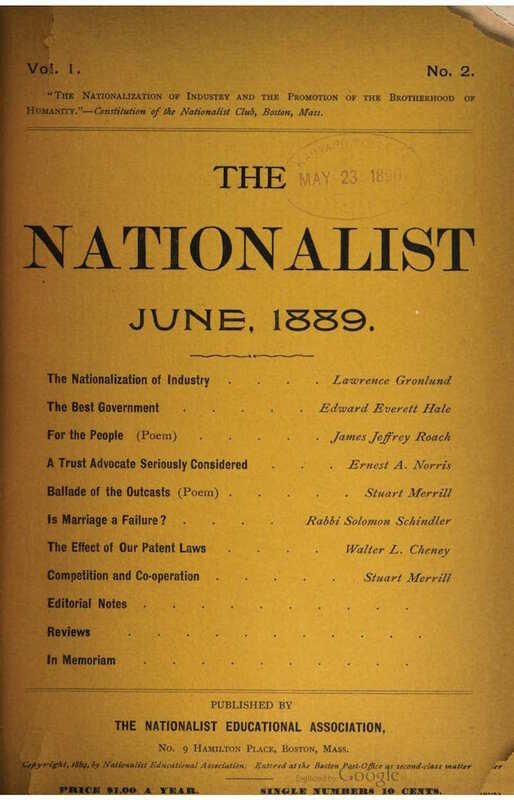 The journal was the product of the Nationalist Club of Boston. The notice in Notes and Queries, December 1891, says that the journal was "Devoted to those matters which will pave the way to the realization of Edward Bellamy's views as set forth in that romantic work 'Looking Backward.' Also the nationalization of industry." Cobb was one of the first vice presidents of the Theosophical Society, and the membership of the Nationalist Clubs in the Northeast disproportionately consisted of Theosophists, spiritualists, and old reformers of various stripes. Contributions by Bellamy, Abby Morton Diaz, Henry Austin, Thadesus B. Wakeman, Cyrus F. Willard, John Ransom Bridge, et al. On the demise of this journal its work was taken up by the New Nation, edited by Bellamy himself, which lasted until 1894. Brown University.